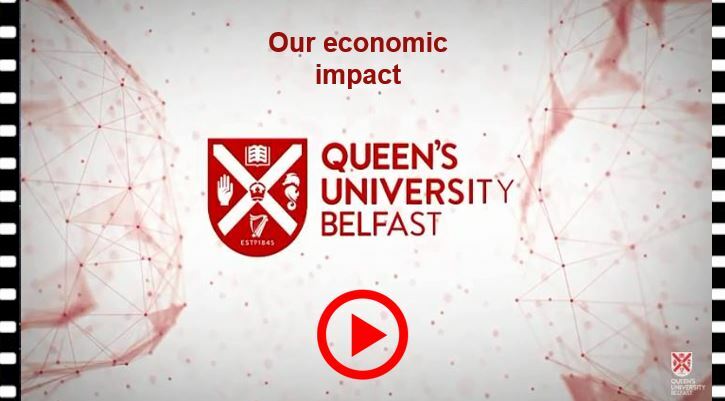 Queen’s University makes a significant contribution to Belfast, Northern Ireland and the UK, contributing £1.9 billion to the national economy, according to an independent analysis by London Economics, one of Europe’s leading consultancies. The research, which looked at the University’s performance during the 2015-16 academic year, showed that the contribution represents an economic benefit to cost ratio of 6:1. The ‘Economic Impact Report’ found that the University employs 3,700 staff and supports a further 2,570 jobs across the UK. The report also highlighted that the public purse benefits by an average of £101,000 per each of the University’s 3,800 full-time undergraduate students, who graduate each year. Commenting on the London Economics findings, President and Vice-Chancellor of Queen’s, Professor Ian Greer, said: “As a global top 200 university, Queen’s University is a place that delivers both local and international impact. This report is a timely reminder of the increasing economic, social and cultural impact of universities. He added: “The report has highlighted that Queen’s contributes £1.9 billion to the UK economy, supports over 6,270 full-time jobs and is committed to working collaboratively. In addition, London Economics reported on the impact of the University’s teaching and learning, its research activities and overseas students. Queen’s teaching and learning produces over £400m in tax income for the UK Exchequer, while £400m in earnings is generated by the University’s graduates. A summary of the key findings from the report are available to download here. Media enquiries to Emma Gallagher, Acting Communications Manager, Queen’s University Belfast, tel: +44 (0)28 9097 3091.